Much too late to make me realise the inadequacies of my own parenting skills, I learnt an important lesson when training my GSD (who is called Pharaoh, by the way). That is that putting more emphasis into praise and reward for getting it right ‘trains’ the dog much quicker than telling it off. The classic example is scolding a dog for running off when it should be lots of hugs and praise for returning home. The scolding simply teaches the dog that returning home isn’t pleasant whereas praise reinforces that home is the place to be. Like so many things in life, very obvious once understood! Absolutely certain that it works with youngsters just the same way. Despite being a very dominant dog, Pharaoh showed his teaching ability when working with other dogs. In the UK there is an amazing woman, Angela Stockdale, who has proved that dogs (and horses) learn most effectively when being taught by other dogs (and horses). Pharaoh was revealed to be a Beta Dog, (i.e. second in status below the Alpha Dog) and, therefore, was able to use his natural pack instinct to teach puppy dogs their social skills and to break up squabbles within a pack. When you think about it, don’t kids learn much more (often to our chagrin!) from other kids than they do from their parents. Still focusing on giving more praise than punishment seems like a much more effective strategy. As was read somewhere, Catch them in the act of doing Right! As it happens, it feels a little like ‘what goes around, comes around’. Why do I say that? Because just last Saturday, I sent off a selection of pictures and videos to Angela Stockdale. Stay with me for a while as to the reason why. Angela trades under the name of The Dog Partnership and, frankly, what she doesn’t know about the behaviour of dogs isn’t worth bothering about! I consider myself so lucky for dogs alone to have been my teachers. I learnt from watching how my own dogs responded to another dog’s body language and vice versa their language. 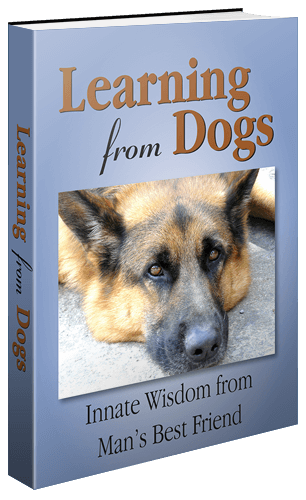 Watching, learning and working with Teaching Dogs was the only way I knew. I was and always will be in awe of a Teaching Dog’s dogs ability to consciously adapt their body language in accordance to how the other dog was feeling. The result being, they could relax nervous dogs but at the same time maintain control of a problem situation. Remember, dogs talk dog far better than we do. It came as quite a shock to me when I learnt about other approaches. It seemed foreign for people to have so much input in resolving what were described as ‘ behavioural’ issues. For me, working with these dogs was far more than resolving a behavioural issue. 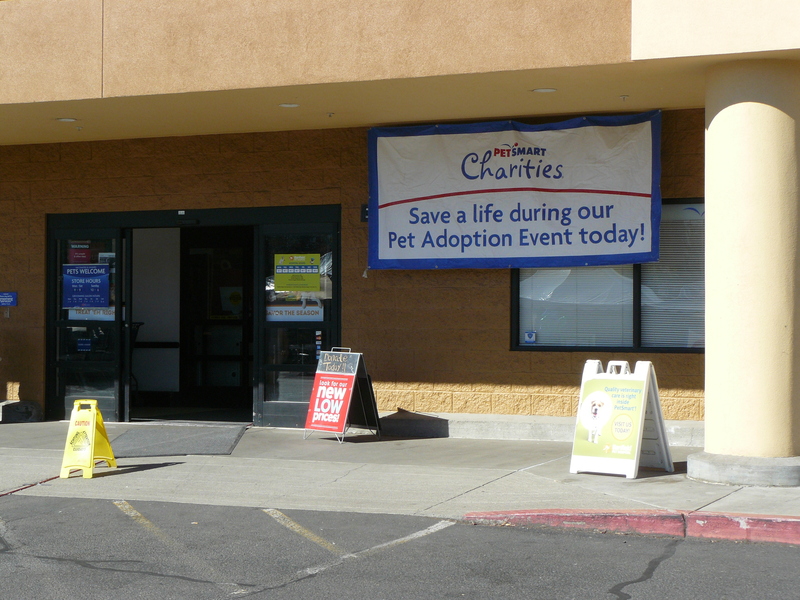 It was about improving the quality of lives of dogs who were not coping with everyday life. If they found dogs or people worrying, sometimes this was shown in displays of aggression. It is important to understand, these dogs were not aggressive, they simply displayed aggressive behaviour. 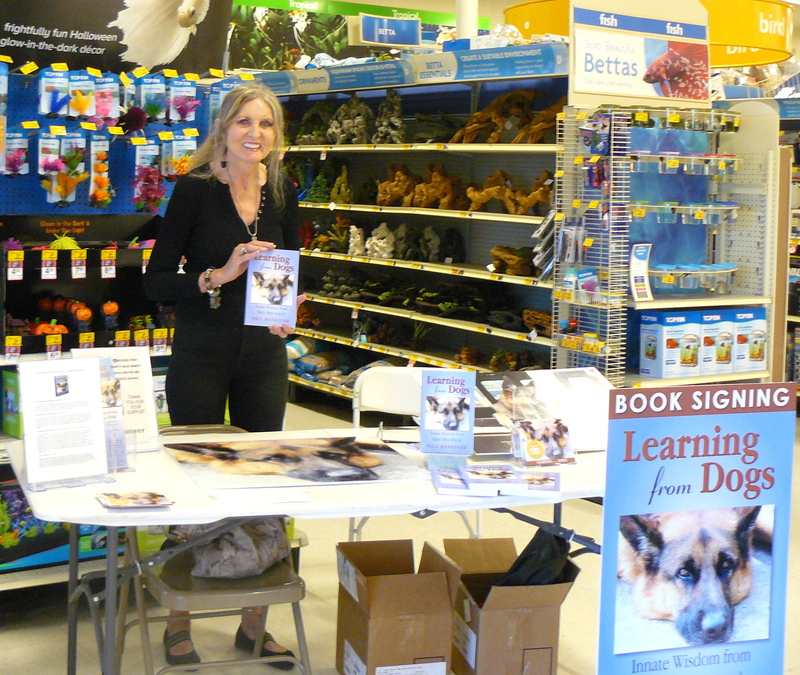 Now, I would like to introduce you to the world of Teaching Dogs and how these special dogs change the lives of less fortunate dogs, who never had the opportunity to really understand how to communicate with their own species. Back to why those photographs and videos had been sent to Angela. A couple of weeks ago, we enjoyed an evening meal with friends of friends, so to speak. This other couple owned a beautiful-looking male German Shepherd dog: Duke. Duke was 4-years-old. Our hostess remarked that he was very boisterous and had nipped a couple of strangers who had called at the house. She added that he seemed difficult to control. Duke had been there for about a month and he was a rescue so they had little or no knowledge of past behaviour. Well, I’m no expect with dogs, that’s Jean’s domain. But there was something about Duke that captivated me. Something in the way he looked at me, his eyes linking so directly with mine, allowing me to see a dog that offered an honest openness. Duke held my gaze and sat back on his haunches. I moved my arm in a complete circle, around to the right, and said, “Duke! Lie down!” Duke lay down. H’mm, I thought. Fascinating. This dog has been professionally trained at some point in the past, using the same ‘command’ system of voice and arm signalling as I had learnt with Pharaoh way back in 2003/2004. The food was now on the table. I grabbed a small piece of meat off my plate and returned to Duke who had, of course, resumed his pottering around the room. “Duke! Here boy!” Duke came over to me. “Duke! Lie down!” Duke did so. I placed the piece of meat on the wooden floor about three feet in front of him. Duke’s eyes were riveted on the meat. “Duke!” Duke’s eyes reluctantly engaged with mine. “Duke! Stay!” I repeated the Stay command a couple more times as I backed away about 6 or 8 feet. “Go on, Boy. Take the meat!” Duke gleefully grabbed the piece of meat. Gracious, I thought, this dog is magnificent. I wonder …….. I took another piece of meat, “Duke! Sit!” “Duke! Stay!” I then backed off that 8 feet again, got down on my knees and placed the piece of meat just between my lips. I knew this was potential madness with a dog I had only met some 30 minutes previously, but there wasn’t an ounce of doubt in my mind. I voiced in my throat for Duke to fetch the meat. Duke came straight over and confidently and carefully removed the meat from my lips. What a truly fabulous dog! It was a wonderful evening and once home both Jean and I were eulogising about Duke. Without question, Jean and I would have offered Duke a new home; in a heartbeat. The only thing stopping that was me wondering if this strong-willed, male German Shepherd might be a Beta dog, as Pharaoh was. Or just might be too dominant a male dog to fit in comfortably with our dogs, especially Pharaoh who was at the stage of life where the last thing that should happen is for his happiness and contentment to be disturbed. I hadn’t a clue as to how to answer that question. But I knew someone who would know: Angela Stockdale. I rang her, caught up on old times and then explained the background to Duke’s situation. Angela said to repeat the exercise that I had witnessed when I took Pharaoh to her all those years ago, when I wondered if Pharaoh was an aggressive dog. 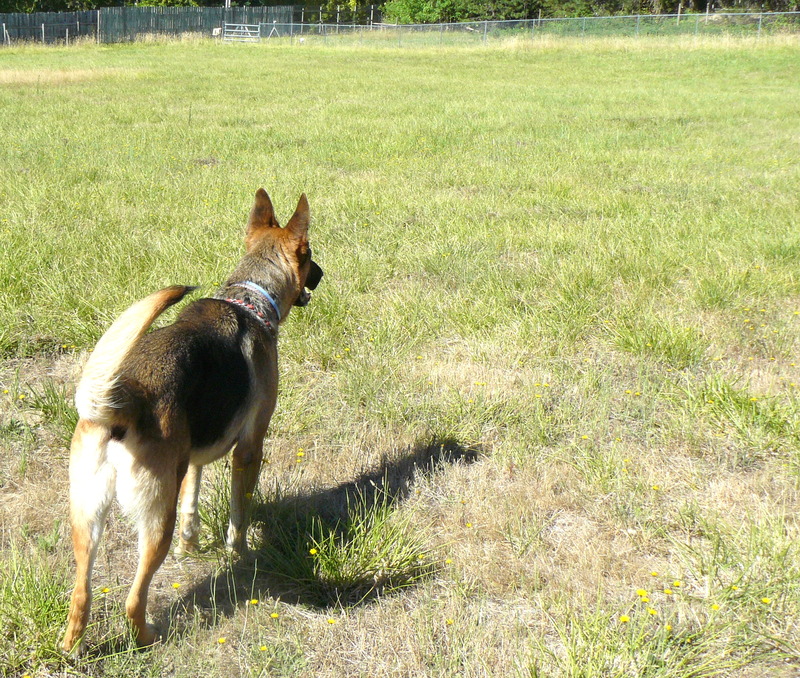 My uncertainty with regard to Pharaoh followed a number of times when walking him in a public area with other dogs and he had been very threatening, both in voice and posture, towards some of those other dogs. This is what Angela arranged. I took Pharaoh up to her place at Wheddon Cross, near Minehead in Somerset. When we arrived, Angela was standing just by a gate into a fenced paddock, maybe a half-acre in size. In the far corner were two dogs. Angela asked me to bring Pharaoh to the gate and let him off the leash. It was clear that Pharaoh was going to be let into the paddock. I cautioned that Pharaoh could be quite a handful with other dogs and, perhaps, it would be better that I walked him into the area still on his lead. Angela said that wouldn’t be necessary. So as she held the gate open sufficient for Pharaoh to enter the paddock, I slipped the lead off him and backed away, as requested. I was astounded and stammered, “But, er, er, how can you tell so quickly?” “Because my two dogs haven’t taken any notice!”, came the reply. 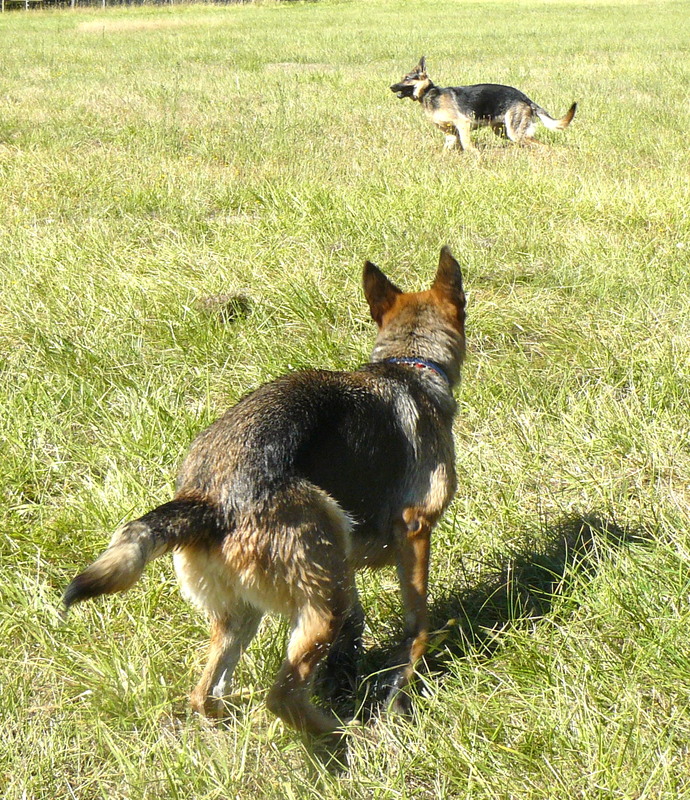 Later Angela explained that in the paddock were her female Alpha dog and her male Beta dog. Ergo, the two top dogs in terms of status so far as dogs see other dogs. In fact, Pharaoh was utterly subservient to these dogs, in a way that I had never witnessed before. Later on, as Pharaoh relaxed and started playing, Angela said that she thought that Pharaoh was a Beta dog. Mixing some of her other dogs into the group was later able to confirm that. So back now to present times and Duke. Thus last Saturday, as Angela recommended, we selected two of our dogs, Cleo our female German Shepherd and the most socialable of dogs, and Casey, a strong but not aggressive male (he had some PitBull in him). Duke arrived and was allowed freely to nose around the large grassed area some way from the fenced-off horse paddock that we were using for the ‘introduction’. Duke pottered around and then caught sight of Cleo and Casey in the paddock. First sighting of Cleo and Casey. Hello! My name is Duke. Do I smell OK? Mr. Casey? And play didn’t seem to be too far off the agenda! You lead, Cleo, I’ll chase! So all the photographs and videos have been sent to Angela, and we will see what the conclusion is!